I’m also introducing you to the all-new Nutri Ninja Nutri Bowl Duo which easily switches from the Nutri Ninja® Cups to the 4-cup Nutri Bowl™ for versatility. Line a 12-cup muffin tin with paper liners. Lightly coat the inside of the liners with cooking spray, and set aside. Next, place graham crackers, brown sugar, and butter in the Nutri Bowl. Select Auto-iQ Boost No Fusion Mix. Then divide mixture evenly in the prepared muffin tins, reserve 1/4 cup for topping. Press on mixture until firmly packed. Next, place cream cheese, sugar, lemon juice, and vanilla into the Nutri Bowl. Select Auto-iQ Boost No Fusion Mix. Remove lid and scrape down sides of bowl, then select start/stop for 15 seconds, or until mixture is creamy. Spoon cream cheese mixture into a medium bowl and gently fold in whipped topping until evenly mixed. Then spoon cheesecake mixture into prepared muffin tins. Refrigerate at least 4 hours, or overnight before serving. Before serving, chop a handful of strawberries and add them to the top of the mini cheesecakes. Sprinkle with the remaining graham cracker mixture over top, and enjoy! o Nutri Ninja Nutri Bowl DUO introduces Nutrient Fusion, which creates a fusion of foods containing nutrients from fruits, vegetables, and other foods. o The one base dual function meal maker elevates the everyday. o For the first time ever, this groundbreaking innovation combines Ninja’s powerful Nutrient & Vitamin Extraction*— breaking down fruits and vegetables to unlock their full potential**– with the all-new Nutrient Fusion* that brings fresh, vibrant ingredients together for flavorful, nutritious meals, snacks, and desserts worth savoring. The 1200-watt motor base makes this food and drink processor a breeze to use! Make breakfast, snacks, lunch and dessert with the Nutri Ninja Nutri Bowl DUO. I love that it includes a 75-recipe book to get you started too. Find everything from smoothies to sorbet and pizza dough recipes inside. The possibilities are endless with this fun new kitchen gadget. I highly recommend adding the Nutri Ninja Duo to your wish list. It is hands down my favorite gadget for making recipes! For larger recipes, try the Ninja Ultima Blender + this easy strawberry smoothie recipe. 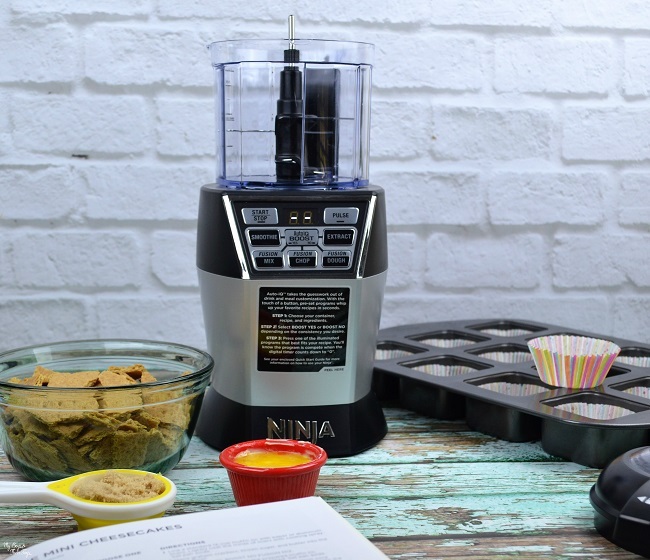 What recipes would you make with the Nutri Ninja DUO? 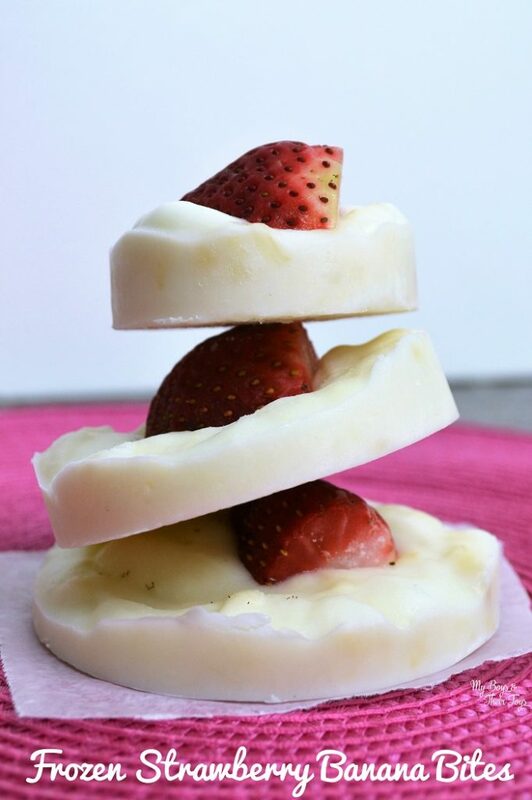 This looks really simple and easy to make! I love the small portion sizes, too! Delicious! 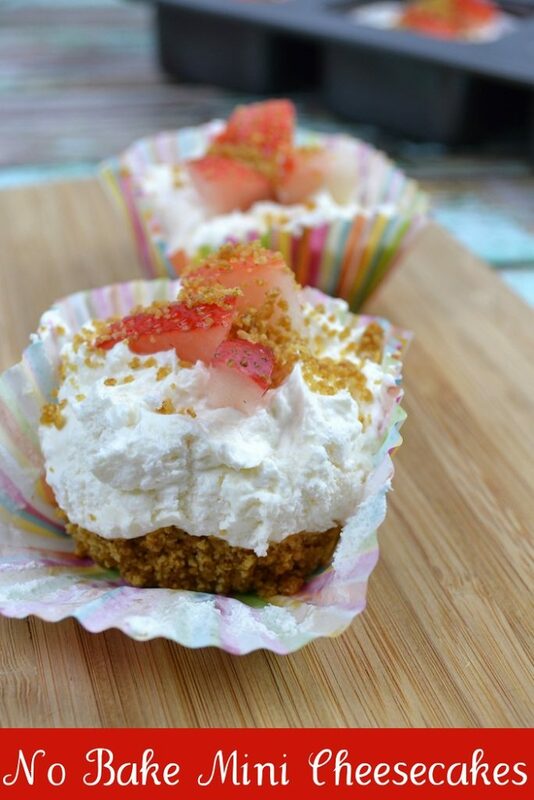 I love no bake desserts and this mini cheesecakes are the perfect size to serve over the Holidays. I want to make your recipe and serve this Holiday season. Thanks for an awesome recipe. Looks easy and delicious!! I want one of those ninjas!! I also wanted to add those look delicious. Perfect size too! I like cheesecake and these seem easy enough to make. I love the indovidual size for everyone. Yum! I love cheesecake, especially freshly made! 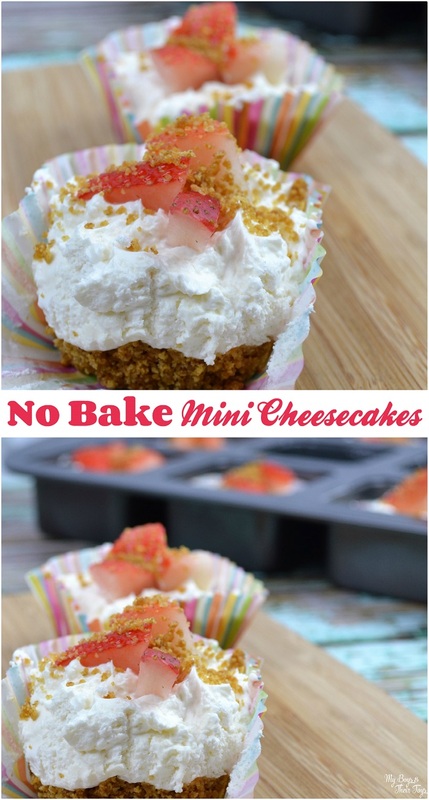 🙂 I love the idea of making mini cheesecakes too, your square pan is awesome! Where did you get it? Cheesecake is my ??! I love the individual portions! oh yay! 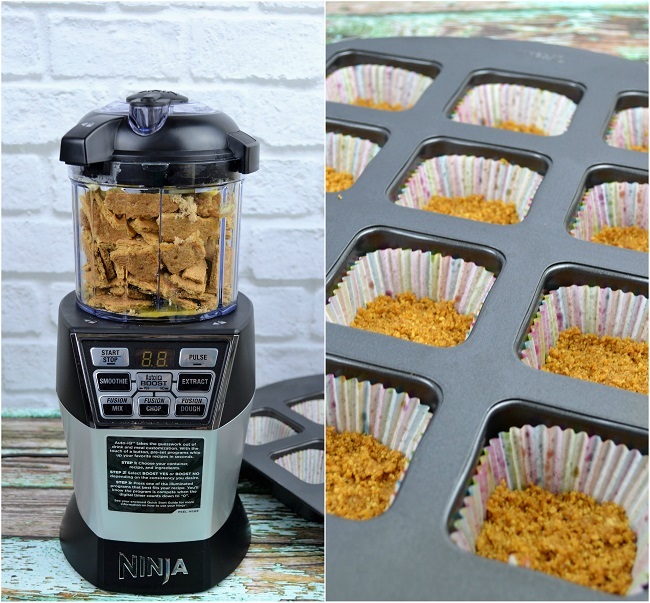 I already have a Ninja and I LOVE cheesecake and simple recipes. I can’t wait to try this! I would love to try to make these. I love the idea of “mini”. I have a Nutri Ninja I have yet to use so now I will have a reason. Thanks for the great recipe!!! 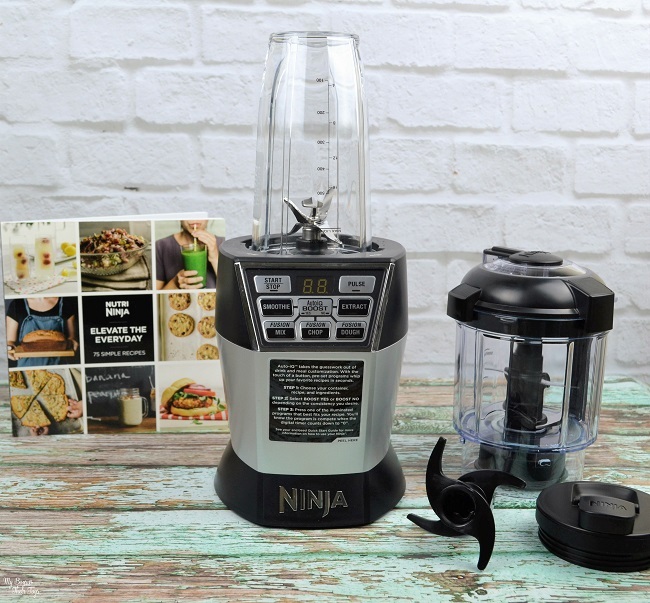 The nutri Ninja duo looks just like what I need. So many uses. These look really good. 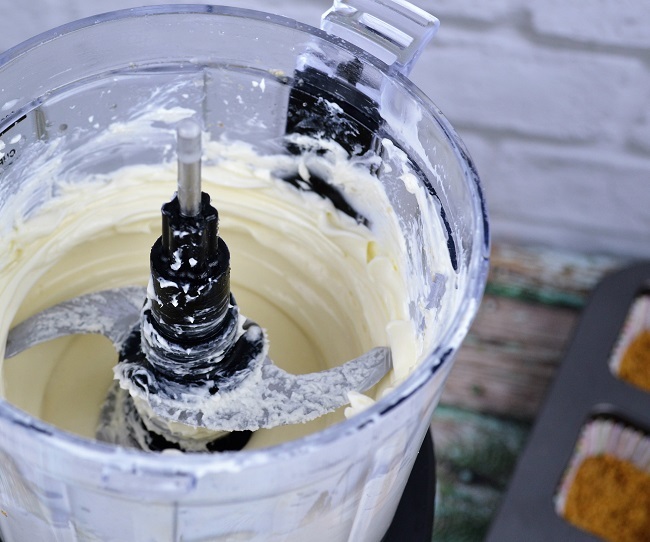 I love cheesecake in just about any form, & the Nutri Ninja looks pretty handy. I love cheesecake, those look so yummy. I have been checking out the Ninja blender I think it would be used a lot in my home. I love easy recipes like this! I would make lots of no baked desserts with the Ninja Duo! I think I would put some chopped hazelnuts on the top and make a berry sauce to pour over at the end – just to be a little different and think about what my families likes. These would be great for when my granddaughters sleep over. They could help make them and their kinda fancy, which they love. These look so GOOD! Cannot wait to try them out! These have to be delicious. And so easy. Love them. I don’t have a food processor mainly because of the space it takes up. This would be perfect. I would make protein balls with dates in them. I have this machine, I could make this! They look marvelously easy. Cheesecake is my favorite dessert, so these look amazing! This looks yummy. I’m going to try this weekend. These look so good and I love how easy they are to make. 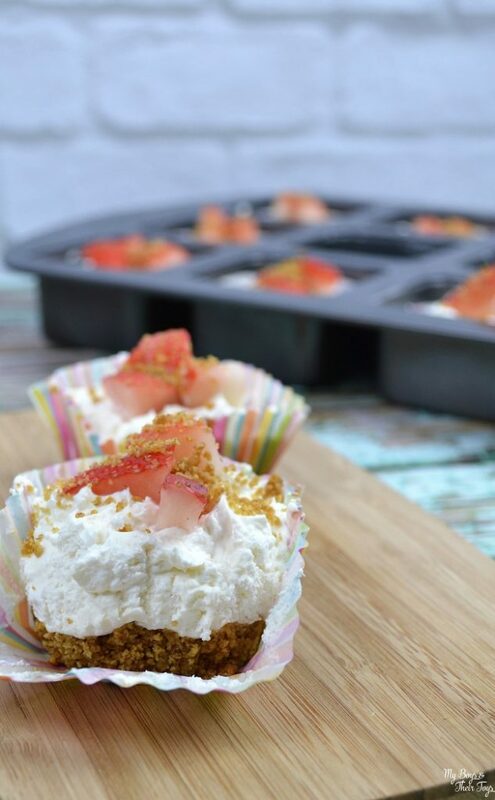 These are so perfect for spring, and I love the no bake. You know these would be gobbled up – and perfect to bring to a get together!